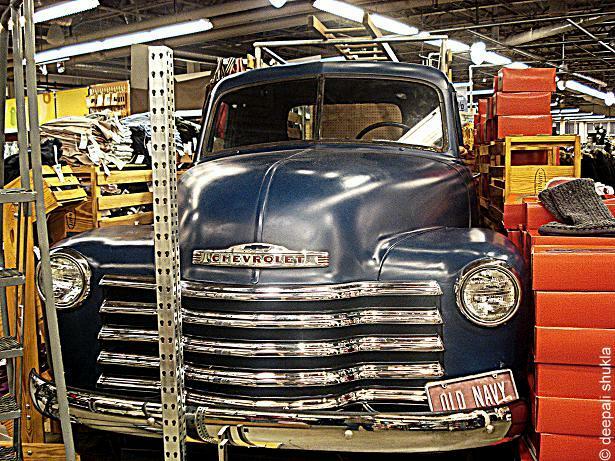 This big chevy is calmly parked at an apparel store’s winter collection and not in a garage. I found it so cute; oddly at ease amid the frenzy of holiday shoppers all around it. Find more BIG stuff here. Very interesting photo for Big. I think so Deepali…my son is in our Navy and they are a funny bunch. That’s awesome! You must be so very proud of him. I am mostly…but he’s a lad, and still in the idiot phase for another two years [until his brain finishes developing] so he is also a worry at times. As all boys are to their mothers I think. Awwwwww…I needed to hear that Deepali – thanks. He’s been a bit cheeky lately has my lad. But he’s good and kind and I adore him…even if I do want to whack him across the head at times. Love the Old Navy license plate! !